Is Vine really being killed off by video for Instagram? We knew that Instagram video would be a problem for Vine. But is it actually chewing up and spitting out Twitter’s looping video service as swiftly as some are suggesting? If you use Topsy’s free analytics tool, it sure seems like Vine is in an unstoppable free fall of doom. Looking at the graph that pops up when you compare shares of instagram.com links versus vine.co links, you’ll see that Vine shares started dropping the day of the Instagram video announcement, to the tune of a 40 percent decline. And Marketing Land reports that Vine continued to lose momentum over the weekend, with shares dropping even further, to a 70 percent decline from a week after Instagram’s video launch. Yowza. That looks like a really bad sign for Vine, especially since it is owned by Twitter and previously enjoyed more frequent shares than Instagram photographs. After Vine debuted on Android, the share count looked very different on Topsy, with the six-second videos besting Instagram’s filtered videos just a few weeks prior to the Instagram video launch. And Vine’s struggles are compounded by a few different factors. Flipboard just added an update to enable Instagram videos, while it still lacks the same capability to show Vines. The positive buzz Vine enjoyed after adding Android was largely nullified by Instagram’s news, since getting a whole new feature set is more exciting than expanding to a different operating system. And Instagram’s esteemed place in the social network word gives it an obvious leg up over Vine, which is still relatively new and working toward establishing itself. Simply Measured looked at how brands are using Vine and Instagram video and found that twice as many Top 100 brands were using the new Instagram video feature compared to Vine, which underscores how Instagram has a huge advantage thanks to its larger audience and the fact that brands were already using the photo service. But the coverage of Vine’s demise is both overblown and unfair. Yes, if you look at the Topsy graph, it seems like everyone decided Vine was rotting at once. But that wasn’t the only graph that Topsy released. In a blog post, Topsy included a second graph available for their Pro users that tells a different story. The first Topsy graph culled data from top “influencers” on Twitter, while their Pro tool lets you look at all Twitter users, which gives a more complete picture of what’s going on. And if you look at all of the mentions and shares for Vines and Instagram videos, the decline of Vine doesn’t appear as swift or certain – and even Topsy agrees. As you can see, Instagram is definitely way more popular than Vine. There was never a point where it wasn’t more popular. 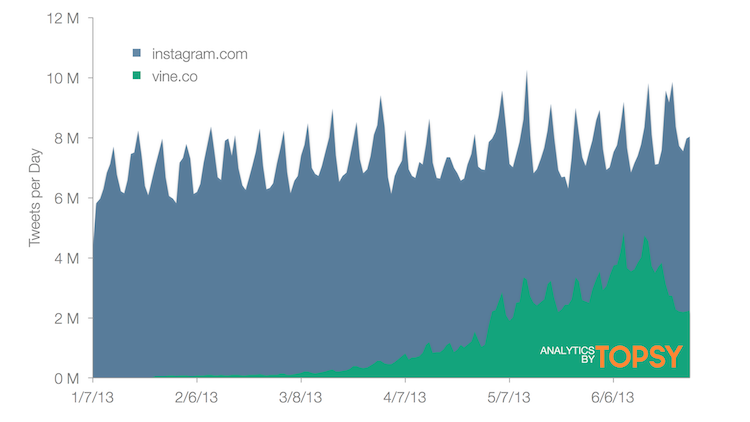 And Vine mentions do dip at the end of the graph after the introduction of Instagram video. But it doesn’t look like Instagram video killed Vine. It looks like Instagram always dominated Vine in terms of popularity and the video feature put a dent in Vine’s fledgling status. But that drop followed a spike created by Vine appearing on Android, so it’s not really fair to say Instagram video started vacuum-sucking all of Vine’s fans away. Looking at Google Trends, you can see that interest in Vine and Instagram more accurately resembles Topsy’s second graph, not its first. Instagram is just a bigger, more popular service. Some comedians and musicians are on Vine, but everyone and the First Lady are on Instagram. It’s a more versatile and better established. You can look at Instagram from your desktop. Of course the fact that it introduced a service that many see as extremely similar to what Vine offers would hurt Vine. When a competitor appears on the scene, especially one with a better pedigree, that generally spells trouble. This all isn’t to say Vine is about to fall off the face of the earth. Sure, Instagram video has fancy filters, a longer run time, and camera-steadying technology built into a service people already use. But Vine’s experienced a viral beginning for a reason. There is space for both Vine and Instagram video to exist and succeed, and just because people paid more attention to Instagram video than Vine immediately after the former debuted doesn’t mean Vine is done. Instagram will likely continue to be a more popular platform, since it offers both photo and video capabilities. But I’d wager that Instagram’s video capability will not take off and become as well-liked or oft-used as its photo feature. The fun of Instagram is scrolling through moments in your friends’ lives, not pausing and watching little video snippets. As it is now, the video snippets on Instagram are less interesting and take more effort to create than photographs – anytime a feature launches there’s an experimentation period and this one could die down. Vine will certainly need to keep improving and taking steps to attract and keep fans to remain relevant (how about introducing an easy way to make silent clips?) but the so-called death grip Instagram has over it is nothing more than an exaggeration of initial excitement over Instagram video.